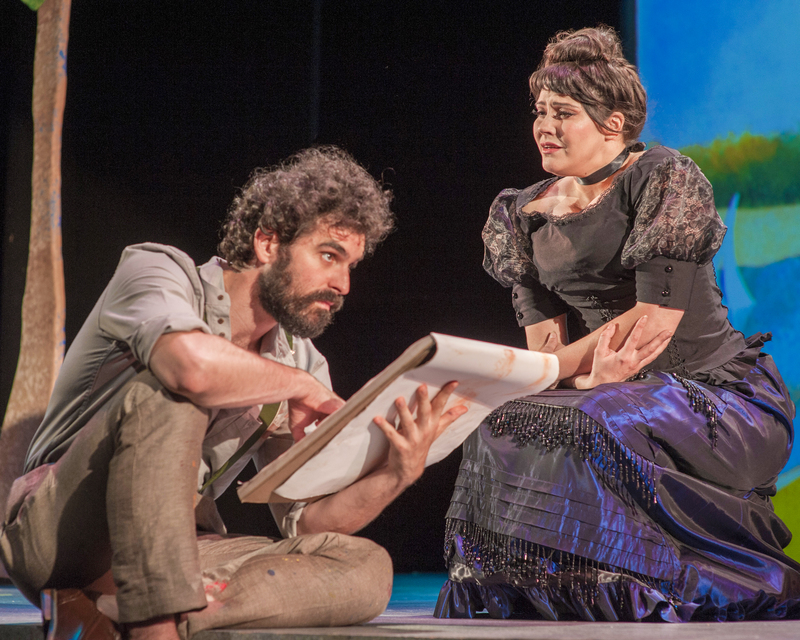 Although there have been a handful of naysayers (alas, myself among them), it is generally agreed that Sondheim’s “Sunday in the Park with George” is a masterpiece of musical theatre, winning on every count: music, book, lyrics, staging. Anybody coming to SF Playhouse’s version with an uncritical admiration for “Sunday” will not be disappointed in this superb production. But those who question the essential excellence of this musical may not be converted. My own belief is that “Sunday” is a beautifully conceived and excecuted musical masterpiece. But James Lapine’s book, with its sentimental take on the loneliness of art making, and Sondheim’s skillful lyrics, sometimes offering more wit than insight, fall short. Nothing lives up to the music. Having admitted my prejudice at the outset, I must acknowledge that this production is quite entertaining. John Bambery, a singer/actor with ample training and experience for the role, is well cast as George. Both handsome and awkward, he brings plenty of emotional depth to all of his interactions and captures the urgency of George’s inner pressures. His wonderful impression of a dog in “The Day Off” is a highlight. As his mistress, Dot, who leaves him for another, Nanci Zoppi sings gracefully, and takes her time (rightly so) in revealing the depths of Dot’s feeling beneath her flirtatious ways. Maureen McVerry is McVerry Good (sorry—I couldn’t help myself) as the Old Lady in the first act, and a comically affected rich New York art collector in the second. The company works together beautifully as an ensemble, and all the minor characters are well-performed. The cast of Sunday in the Park with George take their positions in Georges Seurat’s famous painting. Director Bill English stages everything with attention to detail, and always satisfies the eye. He is equally adept with the set design, ably assisted by costume designer Abra Berman, lighting designer Michael Oesch, and sound and projections designer Heather Kenyon. Music director, conductor, and keyboardist Dave Dobrusky does well with only a few musicians: Two keyboardists, a percussionist, a reeds player, a violin and a horn perform Sondheim’s complex and exciting score. Dobrusky understands this music and presents it brilliantly as a single, complex, thoroughly interconnected whole. “Sunday in the Park” with George continues at SF Playhouse through 09/08/2015. For further information, click here. 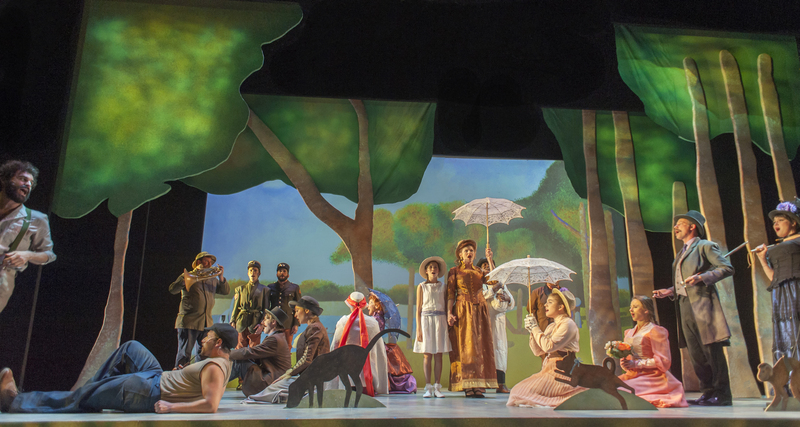 “Sunday in the Park with George,” produced by San Francisco Playhouse. Music & Lyrics by Stephen Sondheim. Book by James Lapine. Director: Bill English. Choreograper: Kimberly Richards. Music Director: Dave Dobrusky. Scenic Designer: Bill English. CostumeDesigner: Abra Berman. Lighting Designer: Michael Oesch. Sound & Projections Designer: Theodore J. H. Hulsker. George: John Bambery. Dot/Marie: Nancy Zoppi. Old Lady/Blair Daniels: Maureen McVerry. Nurse/Mrs. Noomi: Michelle Drexler. Franz/Dennis: Sam Faustine. Louise: Gwen Herndon/Charlotte Ying Levy. Frieda/Betty: Ayelet Firstenberg. Soldier 2/Photographer: Elliott Hanson. Jules/Bob: Ryan Drummond. Yvonne/Hariet: Abby Haug. Boatman/Lee Randolph: Xander Ritchey. Celests 1/Waitress: Emily Radosevich. Celeste 2/Elaine: Corrie Farbstein. Louie/Billy: Anthony Rollins-Mullens.Soldier 1/Alex: William Giammone. Mr. Charles Redmond/Zac Schuman. Conductor: Dave Dobrusky. Keyboards: Dave Dobrusky, Ken Brill. Percussion: Lily Sevier. Reeds: Audrey Jackson. Violin: Pamela Few/Jason Totzke (alternate nights). Horn: Jonathan Betts/Margarite Waddell (alternate nights). Posted in Reviews.Tagged Bay Area Theatre Reviews, Bill English, Charles Kruger, Dave Dobrusky, John Bambery, Maureen McVerry, Nanci Zoppi, San Francisco Playhouse, Stephen Sondheim, theatrestorm. Sondheim’s genius is always the star. Brambery and the musicians are outstanding. But the rest of it? Not so much. Costuming was disgraceful, and the museum scene (half of the second act) was silly. I kept trying to see it as parody, but I’m afraid not. 2 1/2 stars at best. Thanks, Will Obey, for commenting. We agree that Sondheim’s genius (musically, I think) is the star and that both Brambery and the musicians are outstanding. I do think that the costuming was adequate. Historical costumes are notoriously expensive, and your disappointment may be the result of budget constraints to which I choose to turn a blind eye. As for the museum scene–if it is merely silly the fault lies with the authors. However, having spent many hours at arts events, I found the parody to be pointed and accurate. I admit that I am not a big fan of the play (although I AM a big fan of the music), so perhaps I erred in an effort to be fair. But less than three stars, I think, would be unreasonable. I’ll stand by the review as is.